Martyr and King of Denmark, date of birth uncertain; d. 10 July 1086, the third of the thirteen natural sons of Sweyn II surnamed Estridsen. Elected king on the death of his brother Harold about 1080, he waged war on his barbarous enemies and brought Courland and Livonia to the faith. Having married Eltha, daughter of Robert, Count of Flanders, he had a son Charles, surnamed the good. He was a strong ruler, as is proved by his stern dealing with the pirate Eigill of Bornholm. The happiness of his people and the interests of the Church were the objects he had most at heart. To the cathedral of Roskilde, still the royal burying-place, he gave his own diadem. His austerity was equalled by his assiduity in prayer. An expedition to England, in favour of the Saxons against William the Conqueror, planned by him in 1085, failed through the treachery of his brother Olaf. 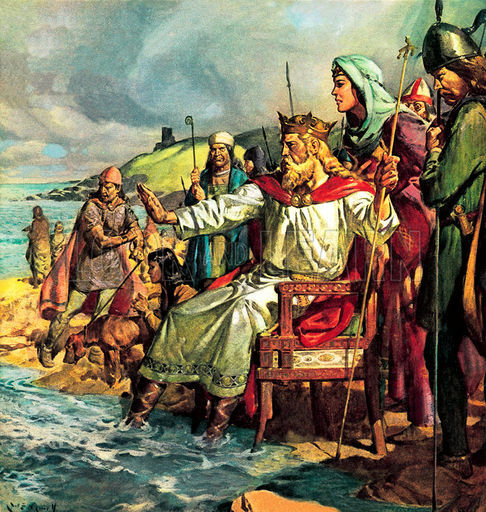 His people having revolted on account of the cruelties of certain tax-collectors, Canute retired to the island of Funen. There, in the church of St. Alban, after due preparation for death, the king, his brother Benedict, and seventeen others were surrounded and slain, 10 July, 1086. His feast is 19 January, translation, 10 July; his emblems, a lance or arrows, in memory of the manner of his death.